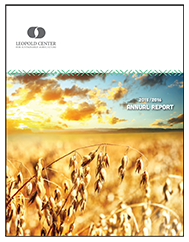 AMES, Iowa—The Leopold Center for Sustainable Agriculture’s 2016 annual report is now available in print and online. The report reviews the 2016 fiscal year –July 1, 2015–June 30, 2016– and was mailed to requestors in late November. The annual report features stories of change, accomplishment, and honors. It chronicles new and continuing grant programming for the Center’s research initiatives of Ecology, Marketing and Food Systems, Policy, and Cross-cutting, and also summarizes the finances for the fiscal year. A letter from Advisory Board Chair Erin Irish anchors the report. She has served on the advisory board for 12 years and remains hopeful that Iowans will use the best solutions to change agriculture’s status quo. “If the current paradigm isn’t working well for us or the state’s natural resources, the Leopold Center and its researchers and farmer-collaborators are continuing to search for the answers that will work. I hope that our policymakers will have the resolve to embrace more of these science-based solutions.” Irish is an associate professor of biology at the University of Iowa. Wallace Chair for Sustainable Agriculture researches ag alternatives. The Educational Grants program supported events across Iowa including the Iowa Prairie Conference at the University of Northern Iowa, Seed Savers Exchange annual conference and campout, the Ag Urbanism Toolkit annual event, the first Soil Health Conference, the Up! Up! Film Festival in Winneshiek County, and others. Newly funded research projects cover a range of topics such as bacteria in swine manure, microalgae-based fertilizer, biofuel cropping systems, soil organic matter, food hub expansions, Latino grocery stores, help for beginning farmers, the value of shade in grazing systems, farmer adoption of conservation practices, and more. The report can be downloaded in PDF format on the Leopold Center’s website: https://www.leopold.iastate.edu/2015-2016-annual-report. Print copies of the report are available by calling 515-294-3711 or emailing a request to leocenter@iastate.edu (please include a mailing address). It can also be found on the ISU Digital Repository, along with all previous years’ annual reports: http://lib.dr.iastate.edu/leopold_annualreports/.